Amitava Chowdhury, a general physician, often asks his patients, “Do you sleep well?” When answered in the affirmative, he follows with, “How many times do you wake up at night to urinate?” More often than not the answer is three to four times. This implies his patients suffer from disturbed sleep. Only a handful of people report it to doctors. For the rest it is part of their lives. Chowdhury’s patients are not stressed-out city dwellers, but fishers, farmers, honey collectors and frail-bodied women who catch prawn seeds in waist-deep water, discounting threats from crocodiles, sharks and the occasional tiger. They belong to the Sundarban Delta, the largest in the world, scattered across the mouth of the Bay of Bengal, from India to Bangladesh. Of the 102 islands on the Indian side, only 54 are inhabited and are home to some five million people. Over two million live in the active delta. These southernmost inhabited islands change their shape almost every day, with shifting courses of river channels and powerful tidal waves eroding land from one side and building sandbanks elsewhere. People here live under constant threat of submergence. On the one hand, riverbeds are swelling due to silt deposition, while on the other, according to a study by Jadavpur University at Kolkata, sea levels in the Bay of Bengal are rising at 3.14 mm per year due to global warming. Two islands have submerged; the third, Ghoramara Island, is sinking. From above, the islands look like saucers floating on water. Though earthen embankments around them keep out the surrounding saltwater, protecting the inland ecology and habitations, they are no guarantee against nature’s fury. Aila has proved this. “Subsequent government apathy, fields lying saline and barren for over two years now, dwindling livelihood options are literally driving the people mad,” adds Das. Agrees Chowdhury, who treats the Sundarban islanders at weekly healthcare facilities organised by various non-profits. There is a dramatic rise in the number of mental health patients since 2009. Around 30 per cent of the population complains of illnesses ranging from insomnia to acute depression, he adds. Anti-anxiety drugs like alprazolam, a popular antidote to insomnia, have become household names in the islands. Kedar Banerjee, a psychiatrist from Kolkata, who holds monthly camps at TSRD-run healthcare facilities in the Sundarbans, says psychological disorders like post-traumatic stress disorder (PTSD), where patients feel anxiety, choking sensation and fear of an impending doom, have also gone up post-Aila. Take the case of Rina Giri of Kumirmari Island of Gosaba block. The 45-year-old feels a nagging pain all over her body. When Giri travelled to Kolkata for treatment she was diagnosed as a psychotic with no physical illness. She grieves the seven cows she lost in Aila and the house she lost twice, first to the cyclone of 1988 and then to the super cyclone. 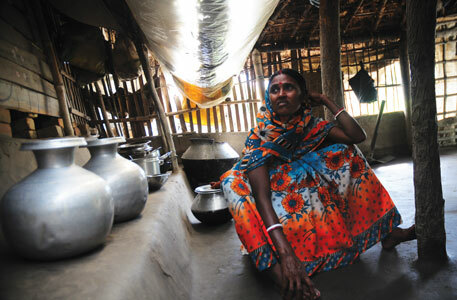 Giri and her husband now live in a cattle shed. Last year she tried to kill herself by consuming Butex, a lice poison. To relieve the pain, she submerges herself in the mud of a pond for hours. Such cases of attempted suicide, a manifestation of extreme mental illness known as deliberate self harm (DSH), are high in islands severely battered by Aila, but there is no data on it. Villagers draw a blank when asked about DSH cases to avoid police investigation. Some distance away in Satjelia, another island in Gosaba, 70-year-old Parul Mallick does not remember the last time she slept through the night. To her, a drizzle or a stormy night means disturbed sleep. Her 30-year-old unmarried daughter and 12-year-old granddaughter sleep together in a huddle, fearing that water might carry them away. The family lives outside the embankment that guards the island. During high tide, which comes twice a day, water rises over two metres above the island level. Mallick’s house was not always on the edge. But Aila brought six-metre-high waves, which washed away the embankment as well as her house, and ate away a portion of Satjelia. The islanders built the new embankment further inland, leaving a portion of the island and Mallick’s rebuilt house for the next strike of the river. Her son left with his wife for the Andamans in search of work and has not returned since. With no source of income or BPL card for subsidised ration, her mental trauma only increases as she awaits the grant of Rs 10,000 promised for rehabilitation of Aila-victims; around 70 per cent of Sundarbans’ Aila victims are yet to receive the money the state had promised three years ago. Incidences of deteriorating mental health are not just a consequence of the super cyclone, says a 2007 study published in the Indian Journal of Psychiatry. An analysis of the admission data from 13 block primary healthcare centres (PHCs) in the Sundarbans shows an average of 11 DSH patients were admitted every month in each PHC between 1999 and 2002; two-thirds of them were women. Aila has just made the conditions more pronounced. Besides poverty and economic stress, a 2010 study by the Institute of Health Management Research (IHMR), Jaipur, blames the increasing cases of mental illness on the complex set of psycho-social stressors that include marital stress, alcoholism, extra-marital affairs and a growing insecurity against nature’s challenges. Even though the islands, formed of nutrient-rich alluvial deposits, are highly fertile, farmers are under constant fear of saltwater’s advance. Once saltwater inundates farmlands, it takes at least two monsoons for the field to revive. Government schemes to address food security (PDS) are grossly inadequate—only one or two members of a family below the poverty line are covered for the benefit. The Mahatma Gandhi Employment Guarantee Scheme (MGNREGS) of the Centre provides no more than five to six days of work in a year as against the promised 100 days. This triggers distress migration. Field surveys by non-profit TSRD show 66 per cent of the able-bodied men have migrated, leaving behind the elderly, women and the disabled; the figure is 75 per cent in islands like Kumirmari. “Those who are left behind are mentally traumatised which has affected their physical health and vice-versa,” says Chowdhury, adding that the public healthcare facilities of the Sundarbans are a hollow facade. “We are struggling so much with physical health problems that mental health has taken a backseat,” says Dilip Ghosh, director of the National Rural Health Mission, West Bengal. In January last year, 22-year-old Ganga Bain of Satjelia lost her child while giving birth. She had approached a quack, worried that she did not have labour pain even after the expected date of delivery. The quack administered an injection to induce labour. The baby was born, deformed and dead. Bain is pregnant again, but the memories pain her. She gets little sleep and has recurrent nightmares of dead snakes and dead babies. She is unsure if her next child will be born alive and healthy. At 42 kg, the five-month pregnant Bain is severely underweight, says Chowdhury, suggesting that she should get an ultra sonogram (USG) done. The test is a must to check the growth of the foetus as well as to determine whether the expectant mother needs a caesarean. For Bain, it is a near-impossible proposition, even though she is aware that approaching a PHC might award her with Rs 1,000 under the institutional delivery programme of the National Rural Health Mission. The programme, which offers Rs 500 to the pregnant mother to take care of her nutrition and another Rs 500 for the newborn, aims to promote childbirth in government hospitals to reduce maternal and neonatal mortality. But to reach the nearest PHC in the block headquarters, she has to walk for a distance, change two ferries and ride on rickety motorised pull carts, called engine vans, on a bumpy road. The journey takes at least four hours during the day time. If she needs medical attention after 5 pm, Bain will have to hire a diesel boat, which will cost her Rs 1,200. Even if she makes the arduous journey, the PHC does not have a USG machine and she will need to proceed further for two hours to reach Canning town on the mainland. She might not receive the attention yet. The government Rural Hospital at Canning does have a USG machine but the technician visits twice a week. Besides, a pregnant woman needs to register a month in advance for a USG. This is the reason Bain landed up at the quack’s while delivering her first child. The private clinics in Canning charge Rs 400 for a USG and upwards of Rs 5,000 for caesarean. Her husband, who after Aila had gone to Andhra Pradesh to work at a construction site but returned empty handed after being cheated by the contractor, cannot afford the treatment. 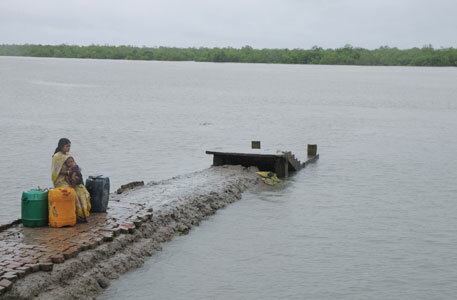 According to Chowdhury, cash incentive alone can never ensure institutional delivery in the Sundarbans, which lacks in basic infrastructure like blood banks, USG and emergency caesarean facilities, and healthcare providers. In fact, the entire public health care system is in a shambles in this remote delta, he adds. 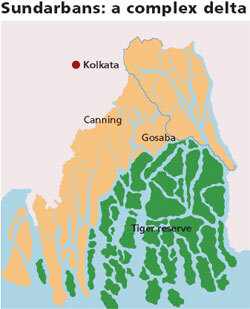 The word “remote” has different connotations in the Sundarbans, depending on whether one is a tiger tourist or an islander seeking healthcare. It is possible, for instance, to buy the finest scotch or to have chilled beer in air-conditioned cottages in the eco-tourism resorts, barely 30 minutes boat ride from where Ganga Bain lives. But there is no facility to administer anti-venom serum in case of snake bites or regular water and electricity supply to PHCs. 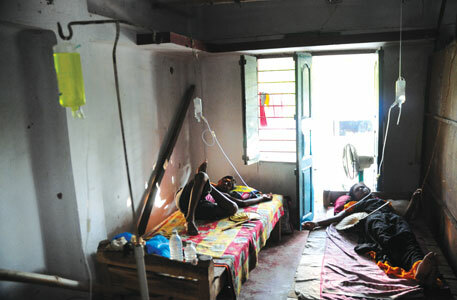 A visit by Down To Earth to the 30-bed Gosaba block PHC proved nightmarish. A middle-aged woman was cleaning the female ward of the vomit and excreta scattered around. Her mother was admitted the night before with severe chest pain and was screaming. A relative of another patient roamed the wards looking for someone to read the thermometer. Of the five nurses, three attendants and two sweepers on the rolls, one nurse and one attendant were on duty. The block medical officer, a burly Girin Mandal explained the challenges of running a PHC in the remote area. The hospital received electricity supply only in 1997, and he prides himself in doing forceps-deliveries under kerosene lamp. Thanks to a bio-gasifier plant the PHC now gets between six and 10 hours of electricity every day. During his 25 years of posting at the PHC Mandal is accompanied by only one more physician to cater to the population of 240,000 in the block. Post Aila, the PHC had got four doctors from the National Rural Health Mission—all of them either resigned, are in the process of getting themselves transferred or are on leave. “No one wants to work in a place so remote and without basic amenities. The government does not offer any incentive to work in a remote area,” Mandal says ruefully. Ironically, he adds, 60 doctors who passed out from state medical colleges belong to Gosaba. In the absence of a rudimentary public health infrastructure, quacks or rural medical practitioners (RMPs) provide 62 per cent of medical care in the Sundarbans, notes the 2010 IHMR study report. Down To Earth visited two quack-run hospitals in separate islands of the Gosaba block. On the Kumirmari Island, the only medical facility which caters to a population of 17,000 is run by one 28-year-old Julfikar Sardar. The quack claims, the residents settled him there as the nearest government in-patient facility is eight hours away and many did not survive the long journey. Besides most patients have the option to pay him in easy installments. In the past seven months, Sardar has done seven caesareans (Rs 7,000 per caesarean delivery), six hysterectomies (Rs 8,000 per case), and 12 appendicitis operation (Rs 6,000 per case). The cost of treating a minor stroke is Rs 1,000 and Rs 900 for severe diarrhoea cases. Sardar says patients usually approach him after they are turned down by the Gosaba block PHC, which does not have the necessary facilities. For anaesthesia he uses an injection popular in these areas, ketamine—a risky substitute for the otherwise indispensable anaesthetist required during surgeries. The patient might not regain consciousness or die of a cardio-respiratory arrest if ketamine is administered in an incorrect dose. On Satjelia, the southernmost inhabited island beyond which lies the Sundarbans Tiger Reserve, one 22-year-old Sibu Barman runs the Taiba Nursing Home, which is visited by experienced quacks. Satjelia has no government facility except a maternity centre for normal deliveries and Barman’s nursing home caters to over 22,000 islanders. The day Down To Earth visited the nursing home, two young girls were lying in bed, with the saline bottles on drip, waiting for an appendicitis surgery. Alongside, a 17-year-old boy was also waiting for an operation for hernia. The operation theatre looked surreal—a bare room stacked with medicines and a long wooden table which suits more to a roadside tea stall. The quack, who was to perform the operations, was being operated for a heart ailment in Kolkata. The patients refused to leave despite repeated requests from Barman. Left with no choice, he administered pain killers in the saline for the girls with acute appendicitis pain. The three of them, their families and Barman prayed for a quick recovery of the experienced quack. the reading has made me to think that how the humanity is still surviving in such conditions,is there any remote chance that the living conditions would ever improve ? no wonder the city's slums are growing are expending faster as the survival is hundred times better than the Sunderbans. The reading of this article has also changed my opinion about the slum dwellers, I prey that at least they will survive here. This is an excellent piece. After sometime, I thought I was reading Sainath. In my view the piece draws attention to the basic fact that govt. cannot simply pretend to solve problems through 'direct' money transfers. When there is supply side infrastructural problems there is no alternative to public provisioning. If it is left to market to find solutions you get sub-optimal outcome. As quacks substituting doctors in this case.